When the famous El Primero chronograph was presented, it has been flowing through the veins of Zenith, brightly glowing in the firmament of high frequency. Today, it is faced with the multi-speed vision of time in the current decade that requires constant adjustments, Zenith sought to grasp the notion of immediacy, offering its customers the opportunity to touch it with their eyes, to literally “see” the present. We honour its 50th anniversary milestone this year, by recounting the golden decades that made the legend as iconic as it is today. At the end of the Second World War, the watchmaking context was no longer favourable to hand-wound chronographs, but instead self-winding movements that kept accurate time on their wrists were deemed as a “modernity”. In keeping with the era’s ethos and aspirations, Zenith grasped the opportunity with the introduction of the El Primero movement, launched at a press conference held in Le Locle on January 10, 1969 – a high-frequency movement, gestated during the seven years prior, that did not just wish to adjust, but to rethink. Launched under the name of MZM Holding, Mondia Zenith Movado, a consortium created in the late 1960s, the El Primero movement came at a time when the watchmaking industry was at its most competitive, with other companies such as Seiko, Hamilton, Breitling, Heuer and Dubois Dépraz were in the running to launch the first self-winding chronograph. Translated from Spanish as “the first”, El Primero marked the beginning of totally innovative production methods independent of chronograph winders. The high frequency contributed to an accuracy at 36,000 vibrations per hour – thus enabling the split of the second into 10 equal parts, allowing the large seconds hand to display 1/10th of a second – whereby potential shocks are much less likely to have an impact on the movement of the watch. In 1970, 16 Swiss brands created a consortium of market quartz watches, and the Swiss were quickly joined by the Americans: Motorola, Texas Instruments and National Semiconductor. Before long, the El Primero movement was competing with quartz movements. On May 28, 1971, the company was sold to Chicago-based Zenith Radio Corporation, followed by MZM Holding’s dissolvement on June 21, 1972. By the mid-1970s, the American administrators no longer believed in the future of mechanical watchmaking. They decided to cease production of mechanical movements, and disposed of the tooling and machinery stocks required to manufacture the movement. Against all expectations, and against management orders, the fate of the El Primero rested on one Charles Vermot, a foreman who was in charge of Workshop 4 in the Le Locle manufacture at the time. With a foresight of a future for mechanical watchmaking, he safeguarded the tools necessary for the manufacture of El Primero in the greatest secrecy: about 150 presses (worth about 40,000 francs each at the time), cams, operating plans, cutting tools and manufacturing plans necessary for the recreation of the El Primero movement – a total reconstitution that would have amounted the company up to seven million francs. Vermot managed to smuggle the trade secrets of the El Primero movement to the attic and had that part of the building walled up. After the takeover by Dixi in 1978, Zenith was nothing more than a movement supplier company to certain major brands, such as Ebel and Rolex – brands that played a decisive role in the renaissance of the Manufacture. Despite the quartz race and notwithstanding the much-heralded Swatch, Ebel Founder Pierre-Alain Blum wanted an automatic chronograph with an exemplary movement to offer in 1981. While on the other hand, Rolex wanted to modernise its Daytona model, equipped with an El Primero calibre, a reliable movement that was apparently the best automatic chronograph calibre on the market, which perfectly matched the face of the watch with its 3, 6 and 9 o’clock counter configuration. In 1984, Rolex expressed a demand for a reliable ‘motor’ in large quantities needed to manufacture El Primero for its Daytona model. That was when the silence of Vermot’s deeds in the ‘70s fell, and the walled-up attic was broken down to retrieve the hidden tools required to restart the engines of the El Primero. Vermot was treated to “a nice dinner”, a special vacation trip, as well as his own El Primero chronograph watch, and Rolex signed a 10-year contract with Zenith, as the production of the El Primero calibre resumed, leading to the first Daytona watches equipped with a Zenith movement presented at the Baselworld Fair in 1988. Zenith then relaunched production to equip its own models and chronographs with its own in-house calibre, namely chronographs flagships like Academy, Cosmopolitan and De Luca. This reinstated Zenith’s status as a Manufacture in its place on the Swiss watchmaking scene. In 1991, the Zenith Manufacture celebrated the 700th anniversary of the Swiss Confederation with two exclusive models equipped with two variations of the relaunched El Primero: a 900-piece limited edition chronograph chronometer with a simple date, and a 250-piece limited edition chronograph chronometer with day, month and moon phase – all housed within a yellow gold case. The ChronoMaster served to reposition the El Primero: in highlighting the watchmaking artistry, and not merely industrial know-how, Zenith has created a truly archetypal watch with a very classic design, inspired by the pocket chronometers of the late 19th and early 20th centuries. Its rebirth was further strengthened two years later, equipped with the new Flyback function specially dedicated to aviation enthusiasts, and enriching the Rainbow Flyback models, launched in 1997. 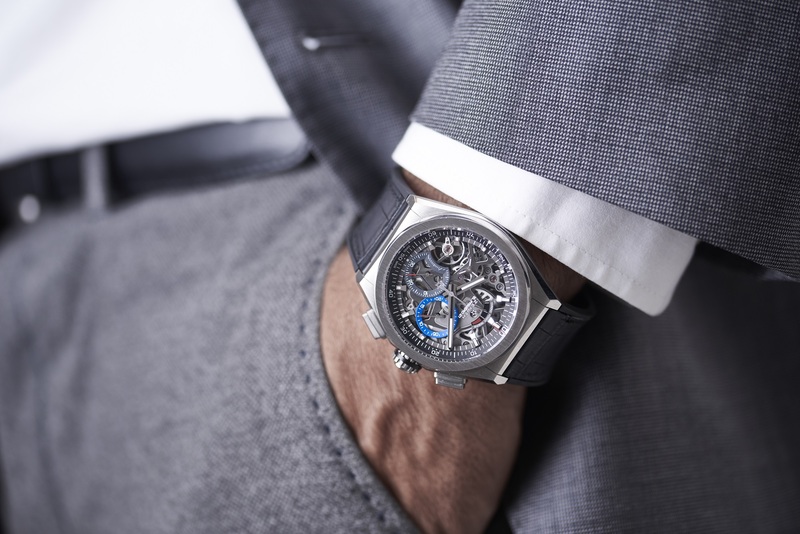 When yet another new decade rolled around, Zenith and the El Primero took to a new direction, when LVMH bought the company in 1999, at a time when luxury groups understood the importance of developing a watchmaking branch, wagering on mechanical watchmaking that enjoyed renewed interest from enthusiasts, and buying up brands with high added value. Zenith was one of those companies brimming with assets: it was a full-fledged Manufacture with a production facility capable of creating its own movements, backed by a magnificent history, with several flagship movements with their own legends under its sleeves, and a phenomenal development potential in the eyes of the new leaders. Under the aegis of the LVMH group, El Primero welcomed ever-more sophisticated horological complications, justified by the raison d’être of its symbol: the star. From 2003 onwards, the heart of the El Primero would appear through the front, through a purpose built dial opening. With this new design, the movement adopted a tourbillon for a model named Grande ChronoMaster XXT Tourbillon in 2004 – the first high frequency tourbillon on the market. It was followed by a perpetual calendar, the Grande ChronoMaster XXT Perpetual Calendar; and in 2005 by the Class Traveler minute repeater, an exercise that required the filing of 30 patents. Finally, in 2007, Zenith combined the tourbillon and the perpetual calendar within the Academy timepiece. The El Primero Striking 10th was launched in 2010, at a time when it’s all about instantaneity, with social media contemporaries like Twitter, Facebook and Instagram – an object that perfectly sums up this decade of immediacy. In 2017, Zenith launched the Defy El Primero 21, which was able to measure and display a mechanical value that was difficult to reach: 100th of a second. This is made possible by an ‘engine’ oscillating at 50 Hz, with the heart of the movement beats at a dazzling speed of 360,000 vibrations per hour. That same year, Zenith presented the Defy Lab, equipped with a revolutionary new monobloc oscillator made of monocrystalline silicon, replacing the balance spring used in mechanical watchmaking since its invention in 1675, as it beats at the extremely high frequency of 18 Hz. Today, we reach the titular time when El Primero celebrates its half-century milestone. Marking the wondrous 50-year journey, the Zenith El Primero 50th Anniversary boxed set holds within the 50-piece limited edition satin-brushed grey presentation box: a reissue of the first El Primero model of 1969; a Chronomaster El Primero with optimised movement; a Defy El Primero 21 accurate to 1/100th of a second; and a fourth stil-empty cushion to accommodate Zenith’s next feats in the field of extreme high frequency, measuring at 1/1,000th of a second.